How best to get to Poynton Park? The Poynton Bonfire is held at Poynton Park, but note there is no parking on-site or on the surround roads. There is a nearby FREE CAR PARKS (see details below). Poynton Park is also centrally located, so walking is the best option. There are also buses which pass right by the park, and the train station is only a short walk. The best, easiest, and most fun way to arrive at Poynton Park for the Poynton Bonfire and Fireworks is on foot. Poynton Park is very centrally located within Poynton and the bonfire night entrance to Poynton Park is the entrance on South Park Drive close to London Road North. Most places in Poynton are less than 1 mile away, and Five Ways is only just over 1 mile; so enjoy the night, leave the car at home, take in the atmosphere and walk. You could even enjoy one of the many Poynton eating or drinking establishments before or/and after the Bonfire & Fireworks. 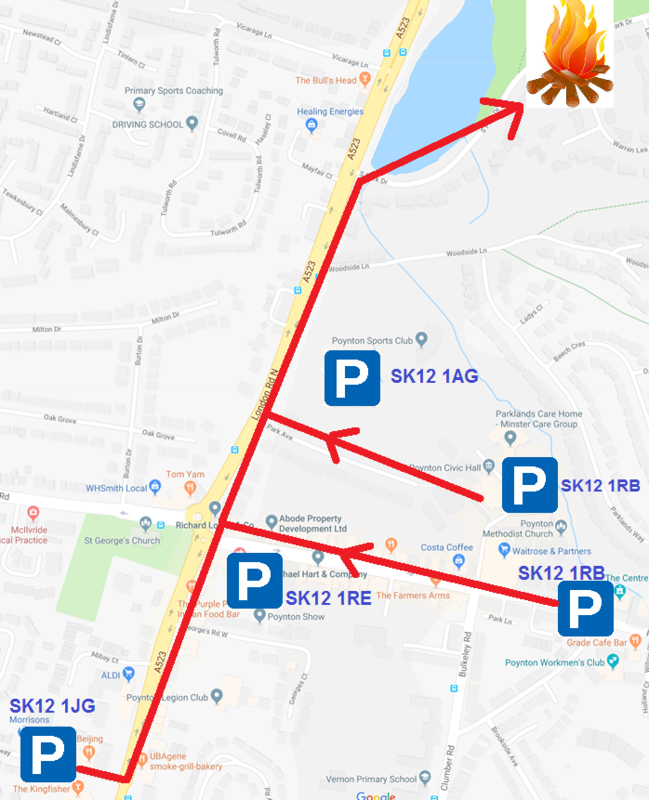 There is also no Parking on surrounding roads (South Park Drive, Anglesey Drive, Woodside Lane, Vicarage Lane, Glastonbury Drive, and all roads off these) as Parking restrictions are in force during the event. Please respect the people who live on these roads close to Poynton Park. Its a short walk away but follow the walking directions below for the fastest route. Turn right into South Park Drive. Poynton Station is about 15 mins walk from Poynton Park (along Chester Road & London Road North). Hazel Grove Station is about 2 miles from Poynton Park but does connect with the 391/392 bus service (details below). 391, 392 - Macclesfield - Poynton - Stockport. For an up-to-date timetable please visit ﻿here. This service passes right by Poynton Park on London Road North.